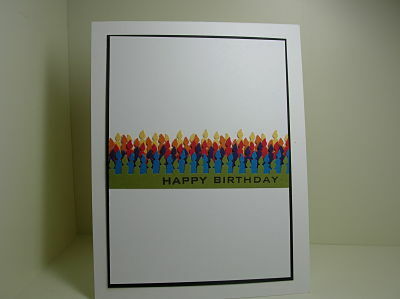 For my first card, I added some depth to the candles by 'feathering' the bases with copic markers. For the second card, I used my candle border punch. In my original vision of this card, I did not end up with the thickness of 6 layers of coloured card stock on the front, but then real life kicked in and man, does this card have (unintentional) dimension! I do like the concentration of colour and overall, I think I prefer this one. For my next post, a real "What was I thinking?!" and re-do for the challenge at damasklove's blog. 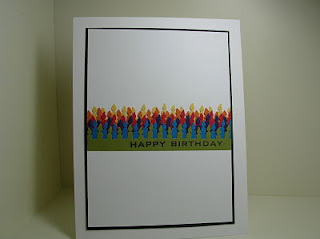 Accessories: Stampamajig, Birthday Candle border punch. 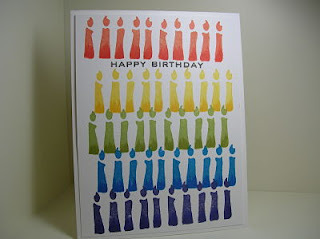 I like the rainbow candles - both cards are super. I think I like the layered look! Wow! Love all those candles in all those colors. both cards are really eye-catching! I really love both cards! Isn't it amazing how different 2 creations from the same inspiration can be? You did a wonderful job!